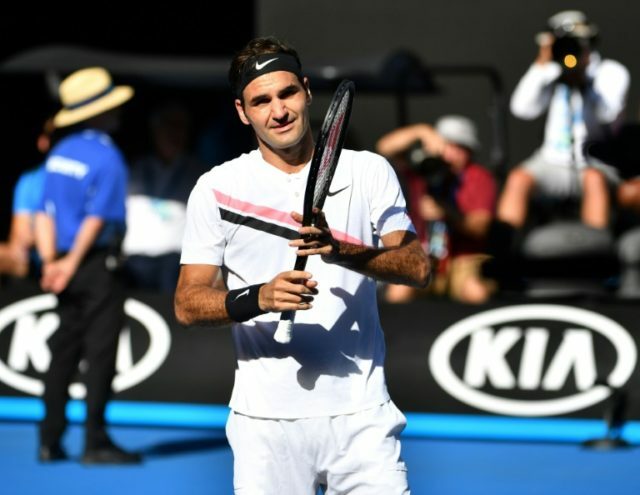 Melbourne (AFP) – Ice-cool Roger Federer roared into an Australian Open quarter-final with Tomas Berdych Monday as world number one Simona Halep and former champion Angelique Kerber stayed on course for a potential last-four clash. The Swiss defending champion swatted aside one-time training partner Marton Fucsovics 6-4, 7-6 (7/3), 6-2 on Rod Laver Arena to make the last eight for an incredible 14th time. The Swiss maestro, 36, has made the quarters every year since 2004, bar a hiccup in 2015. He will now play fellow veteran Berdych, a semi-finalist in 2014 and 2015 at his most successful major, who demolished Italy’s Fabio Fognini 6-1, 6-4, 6-4. “We have had some good ones over the years going back all the way to the Olympic Games in Athens in 2004,” the 19-time Grand Slam champion said of the Czech. Berdych, who is on his way back from back problems, lost to the five-time Australian champion in the third round last year and the odds are heavily stacked again him. Of the 13 quarter-finals Federer has contested in Melbourne, he has won the lot. “I have no choice to choose the opponent and may the better man win,” said Berdych, seeded 19. Romania’s Halep eased through 6-3, 6-2 over unseeded Naomi Osaka of Japan in just 81 minutes, delighted to be off court early after an epic and gruelling three-setter in the previous round. While the win was easy, she continues to nurse a troublesome ankle that she rolled early in the tournament. “The injury is still there. I feel it but I’m trying not to think about it and give it everything,” said Halep, who has never gone beyond the quarters before. She will play either sixth seed Karolina Pliskova or fellow Czech Barbora Strycova, seeded 20, for a semi-final spot. Germany’s Kerber is the only Grand Slam champion left among the women, and she was given a big fright as she chases her second Melbourne Park crown after beating Serena Williams in 2016. At one point Kerber was serving to stay in the match, but she bounced back to win 4-6, 7-5, 6-2. “Credit to her, she played unbelievable. I was running everywhere,” said Kerber, who had a poor 2017 after starting the year as world number one. Hsieh, ranked 88, was always going to be a threat after knocking out world number three Garbine Muguruza and the dangerous Agnieszka Radwanska en route to the fourth round. The win set Kerber up with a clash against American Keys, a semi-finalist in 2015 who has found a new lease of life under the guidance of former great Lindsay Davenport. Seeded 17, she flattened French eighth seed Caroline Garcia 6-3, 6-2 in just 68 impressive minutes. Novak Djokovic is in action later as he looks to reach the last eight in Melbourne for a 10th time, with a tough test against talented Chung Hyeon. The glasses-wearing South Korean, ranked 58, upset fourth seed Alexander Zverev in five sets in the round of 16. The winner will face Austrian fifth seed Dominic Thiem or American surprise packet Tennys Sandgren.